Google Chrome marks its ten-year anniversary later this year, and in that time it has become the most-used web browser in the world. Over 60% of the world’s computers connect to the Internet through Chrome, so regardless of what web browser you personally use, it is important to be aware of Chrome and how your law firm website will be viewed by the majority of people coming to your site. A major change that will affect all websites starting in July 2018 is the labeling of all websites that use HTTP instead of HTTPS as “not secure.” This change has been coming since the January 2017 release of Chrome 56 and has been rolling out in phases, most significantly with the release of Chrome 62 last October and 64 this past January. The upcoming July release of Chrome 68 will include the “not secure” warning on all HTTP websites, as announced in a February 8 post on the Google Security Blog. HTTP stands for HyperText Transfer Protocol and is the way hypertext is transferred or exchanged over the web. The ‘S’ in HTTPS stands for “secure,” and it means that any message or information exchanged over the website is encrypted for security. Think about the forms on your website you provide to encourage prospective clients to contact you. How likely are they to fill out that form when the browser’s address bar is telling them the site is not secure? Starting in July, this icon will be replaced with the phrase “Not secure” to the left of your web address as soon as the page loads. Secure websites – those that start with HTTPS – instead display a locked padlock icon and the word “Secure” to the left of the address, (see example below) giving users peace of mind that they may comfortably browse your website and fill out a contact form with confidence their information won’t be snatched up by some third party on its way to you. Now that you’re thoroughly panicked and ready to act, how do you switch your website from HTTP to HTTPS? You’ll need to purchase what is known as a Transport Layer Security (TLS) certificate. Like its predecessor – the Secure Socket Layer or SSL certificate – a TLS certificate contains a personal encryption key that is placed on the server that hosts your website. Contact the company hosting your website and ask them about installing a TLS certificate on your website. The cost should be minimal and well worth it considering the value of your website as a marketing and communication tool to attract future clients. 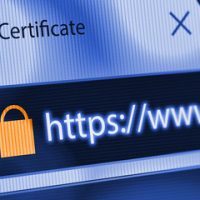 Just as you need to purchase your domain name every year (or for multiple years at a time) in order to maintain ownership of it, the TLS certificate needs to be purchased every year as well to keep your website secure. We offer our clients a turnkey service where for one low price we purchase the certificate on your behalf, pay for a dedicated IP address, install the certificate and make any necessary DNS changes, provided we have access to your domain name servers. Call 800-410-6398 or contact us online for more information and pricing details.